In August 1991, the National Heart, Lung and Blood Institute (NHLBI) released the first clinical guidelines for the diagnosis and management of asthma. These weren’t just the first major guidelines for asthma. They were the first major guidelines for any chronic illness in the United States. The release of the NHLBI guidelines broke a wall of misconception about the use of standardized protocols in medicines. Twenty-seven years later, it’s time to break another wall — this time, with 21st century technology from digital medicines. 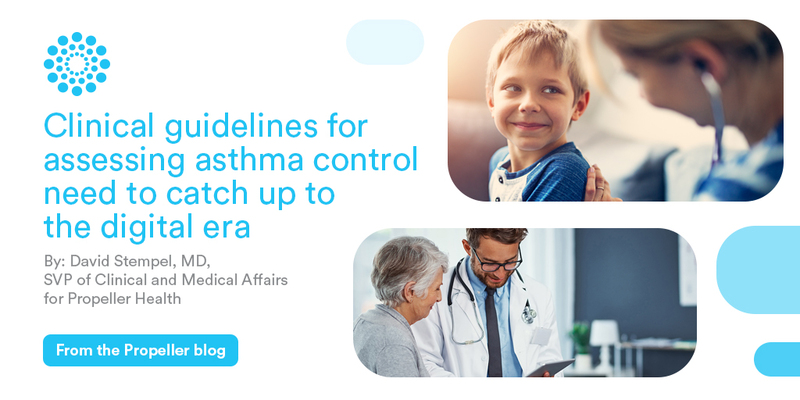 In a 2009 report from the American Thoracic Society (ATS) and European Respiratory Society (ERS) Task Force, the committee put forth guidelines for the clinical assessment of asthma. The committee suggested that for clinical practice, rescue inhaler use should be reported as “occasions” rather than “puffs.” However, the guidelines included no definition of an occasion or its duration. Similarly, the NHLBI guidelines determined asthma control by the number of days per week that a patient used rescue medication, but they don’t specify how to calculate “days” in every situation. This is all complicated by the fact that patient recall of rescue inhaler use beyond the past few days is not very reliable. When a provider asks a patient about the occasions or days they used their rescue medication over the last week or month, neither person can be sure the information is accurate. There are two significant areas that we can now improve on with the use of digital technology. First, we can now use passively collected digital data that does not depend on recall bias. Second, we can use this data to inform the guidelines for how we assess asthma control. This is the subject of the study we recently published in The Journal of Allergy and Clinical Immunology: In Practice, in partnership with the University of Colorado Health and Children’s Hospital Colorado. Now, with data from digital medicines, we can ask: Should rescue use at 11 PM on Monday and 1 AM on Tuesday be defined as two days’ use, or one? Does this hold true even if rescue use at 1 AM and 3 AM on Tuesday is defined as only one day’s use, despite being the same number of hours apart? What determines the number of occasions — separation by time, type of trigger, or early or late phase response? All of this is unclear when we rely on the current guidelines to assess asthma control by occasions. Using the number of puffs may not provide all of the required information, but it does provide a consistent measure that can be applied uniformly. Puffs are already recommended by ATS/ERS as the best measure of assessment in clinical trials. With the development and employment of digital medicines, it’s now appropriate for puffs to replace occasions in clinical practice. Simply put, digital medicines provide objective data that can be uniformly applied to clinical practice. They enable a patient-provider conversation where both parties have the same information and can ground their discussion in transparency. We believe that guidelines should incorporate information gathered from digital technology into their future updates. Progress in healthcare requires that we grapple with medical decisions of the past. These decisions were based on the best available science at the time, but now, they need to change to incorporate today’s advances, including digital health. It doesn’t mean those previous clinicians were incorrect; it simply reflects the continuing evolution of medical science. Read the abstract of Quantifying Beta-Agonist Utilization: Occasions or Puffs? here.